How stunning is this Floral Romance Specialty Designer Series Paper? 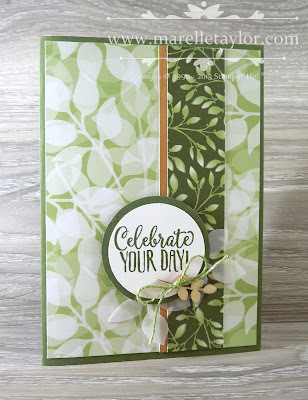 I've used the 2 green leafy patterns, but in the pack there are also 2 stunning vellum patterns, a woodgrain pattern and a pretty Petal Pink one too. I also used a thin strip of Wood Textures Designer Series Paper, to contrast with all that green! The sentiment I've used here is from the Hello Cupcake Sale-a-Bration set. I've stamped in Mossy Meadow. This would be a very plain card without any embellishment. To add a little interest, I punched some leaves from vellum, popped on a wooden leaf element from the Sale-a-Bration Butterfly Elements, and then attached an Old Olive Linen Thread bow with a glue dot.